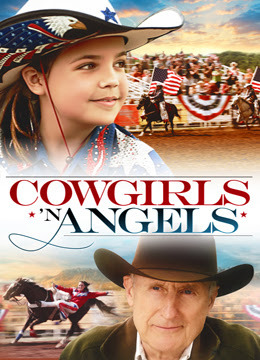 Based on the true story of the "All American Cowgirl Chicks", Cowgirls N' Angels is a heartwarming film that tells the story of Ida, a feisty and rebellious young girl (Bailee Madison; Just Go With It), who has dreams of finding her father, a rodeo rider. While searching for her dad, she connects with the Sweethearts of the Rodeo, a team of young female rodeo riders run by former rodeo star Terence Parker (James Cromwel; The Artist). Recognizing Ida's innate talent for trick riding, Terence recruits her for their ranks. Accepted wholeheartedly by her new "family," Ida finds a new passion that redefines her life, and may also help her find the father she's been searching for. Jackson Rathbone (Twilight) also stars in this inspirational film for the entire family. I had the pleasure of reviewing Cowgirls n' Angels. This is such a great movie. From beginning to the end I spent the entire time both with a smile and at times in tears. The story line is so good and so inspiring I couldn't stop watching. This sets a fine example for kids everywhere that dreams can come true despite if others don't believe you can do it. Bailee Madison did a fantastic job in this movie, I can't wait to see what else is in store for her. A great movie the entire family can sit down and watch together. Cowgirls n' Angels is now out on blu-ray/DVD today and check out the trailer below, even the trailer is that good! Disclosure: All opinions are my own. I received Cowgirls n' Angels at no cost for the purpose of this review. No other compensation was received.